Tall bar tables in the front and regular tables in the back - your choice! 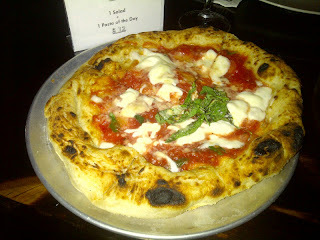 **On our second trip, my thrifty eating compadre managed to snag a KGBdeal for this second meal. Who doesn't love a good deal! Well, the couple at table next to us also had the coupon and as we were being seated, they mentioned the coupon to the waitress. 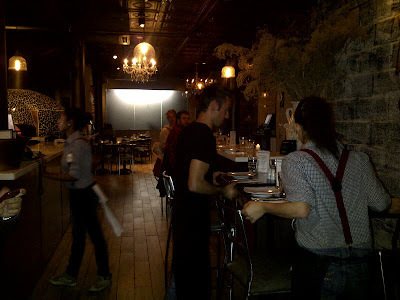 The manager came over and promptly notified our fellow diners that this deal was not real, that Forcella had not made any deal with KGBdeal, and that the website was fake. As such, Forcella could not honor these coupons. Also quickly flying out of his mouth, the manager noted that the police had been notified and were on their way. My dining compadre and I were kind of in a shock, as KGBdeal is a legit site (I've purchased and used deals from them successful before!) and why must any mention of Police be brought in? Right away, everyone feels uncomfortable, as if the manager is insinuating that we have done something wrong. Shouldn't this be between KGBdeals, Forcella, and the Police (if need be)? 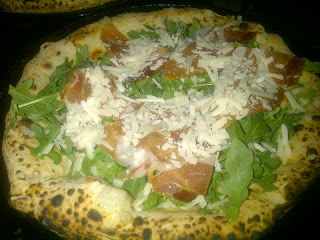 **So the couple kept saying how disappointed they were and how they had been looking forward to trying Forcella's pizza. As they continued to express their disappointment, the manager suddenly EXPLODES in anger and screams at the couple that why should Forcella be responsible for this deal? Why should they have to take a loss and provide a free meal because of a fake coupon? Etc etc... The couple respond back that the manager shouldn't take that kind of tone with them yet the manager continues to yell back. On and on and on...the manager is now bickering with the customer. **Mind you, the couple didn't even look ready to leave yet and were just saying how disappointed they were. They ask for the check for their drinks already on the table and the manager rudely spits out "No check you can go". After they leave, the manager is clearing their table then he turns to us to complain about how rude the couple were and that it was not Forcella's fault. Can someone please tell me, why is a restaurant manager complaining to us about other customers, especially since the couple didn't do anything wrong? Suddenly I feel ashamed to even mention that I also have the coupon! 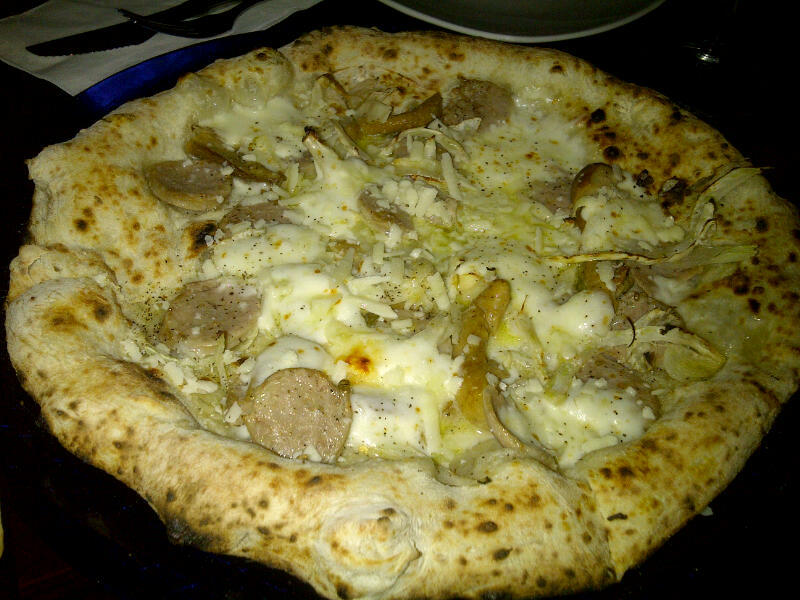 Forcella - not only has your manager ruined the experience for the couple next to us, but you have also lost another customer in me, as well as ALL my friends. Honestly, a quick comp of their drinks and they would have gladly stayed and paid full price for their meal. You may have found another future loyal customer and kept me as well. That is called hospitality. Ughhh, thinking back I just feel sick about my experience. My eating compadre and I were pretty much antsy to get out of Forcella after that situation. I'll just post quickly about the rest of my meal in case you are desperate enough to try Forcella for yourself (and yes, I will be mightily disappointed in you if you do!). We started with a carafe of house red wine (enough for 3-4 glasses) and the Burrata cheese appetizer. 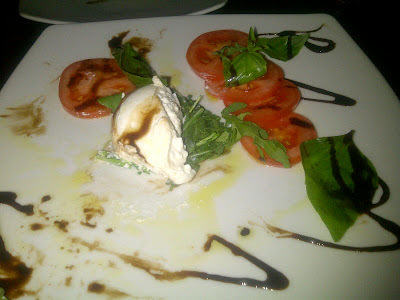 The Burrata cheese was served with tomatoes, super fresh basil, and some balsamic vinegar. This was excellent and should go you, definitely get this. We quickly devoured it and enjoyed every bite of it. 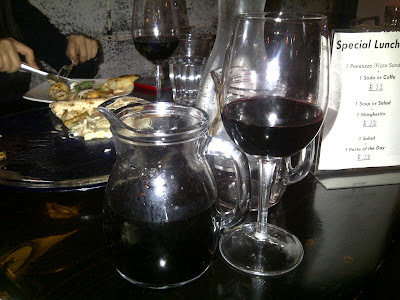 Carafe of red wine - comes full! For pizzas, we got a variety. All were pretty tasty. My personal favorite was the Montanara, which is a half fried and half baked margherita pizza. The frying made the edges all the more crispier and tastier! And for dessert, we got the Millefoglie and Panna Cotta. Both not really that great - skip it and grab ice cream on your way home. 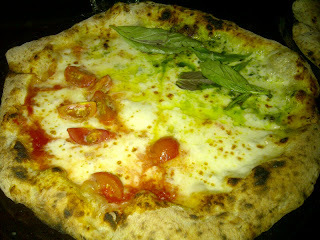 **Although Forcella had great Burrata and pizzas, I can not in good faith recommend this to anyone. I am still in shock regarding the rudeness of the manager. Not only did he speak in an extremely rude and combative tone to a fellow diner (and raised his voice to a customer nonetheless), but he also complained to us right afterwards about the other customers. How rude! If this is the way management works, then clearly they do not want to keep their customers nor want to create a positive dining environment. But yea, that manager needs to get it together. i also had bought the same kgb deal . and you know what ? it was fake. i verified with the KGB they told me that one of their sales people forged all of the info and faked the deal. I spoke to one of the owners and actually felt very bad for them . they were put in a situation where they will be "the bad guy" no matter what. and your review is the prove of that ! After all was said and done they offered me a free desert ( tiramisu ) which was excellent and I didnt even asked for any desert at all . I had called my credit card and will not be paying for that deal . and as to Forcella handling the situation with my table. i couldnt had asked for a better resolution and enjoyed my evening . Its funny , reading your review ,you somehow blame the restaurant and not KGB who defrauded you out of $20.00 . I love their pizza and live few blocks away, I think you should go again and speak with the owners, you might change your mind quick. 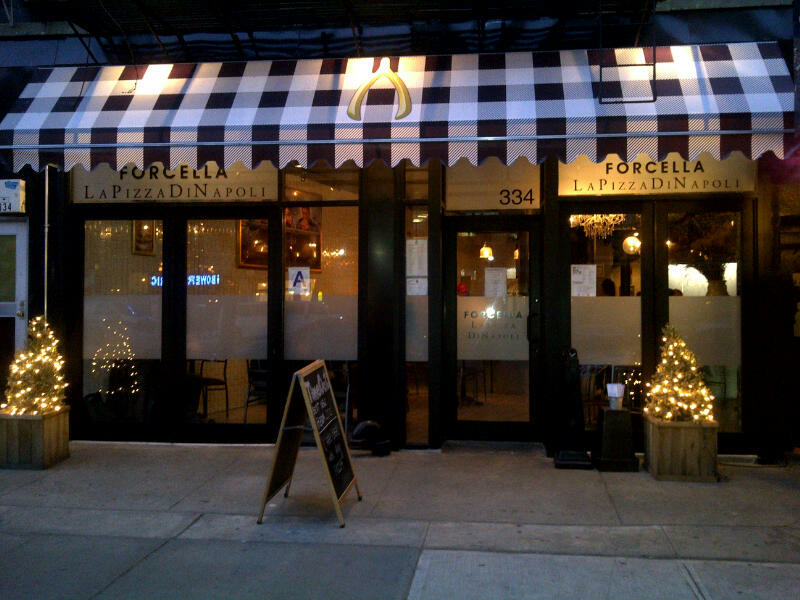 It's certainly Forcella's fault, and not KGB's, for employing a manager who explodes at customers and who does not have the common hospitality sense to know how to fix a situation like this. Forcella WAS put in a bad spot with the fake deal, but if they think screaming at customers that the police are on the way is the way to deal with it, that's very sad. It's nice to know that you had a good experience, but it's extremely disappointing to know that one this bad even happened. Thank you for your feedback. I agree with you 100% that Forcella is not to blame for the fake deal. And I also agree that they were put in a bad situation. What you misunderstand is that my anger is not that the coupon was fraudulent, thus me blaming Forcella instead of KGB. 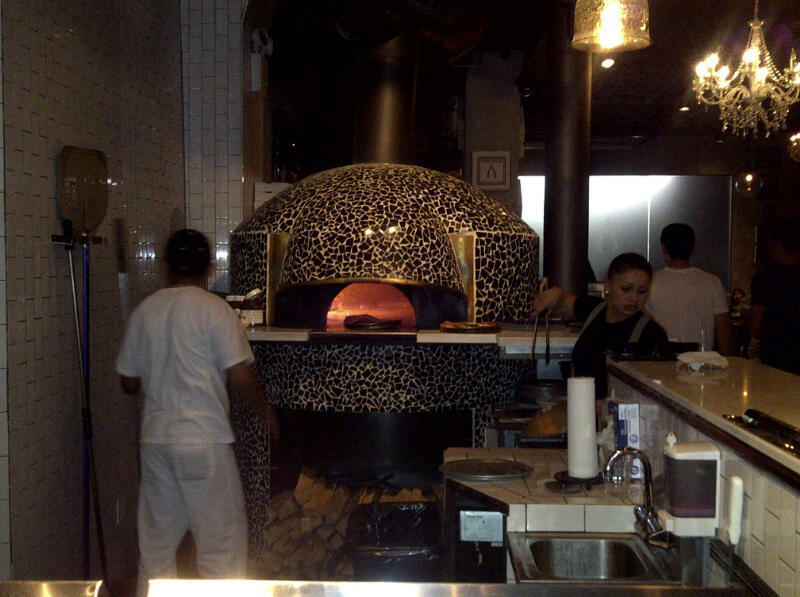 What I did have a problem with was the way Forcella's manager handled the situation. As RC noted above, a manager should never take a hostile or combative tone with a customer especially when uncalled for - I wouldn't even accept that kind of tone from my friends! And worse, a restaurant manager should never have commented negatively about another diner to us. That just put US in an awkward and uncomfortable position. The thought that he would speak that way to a customer and then talk about them behind their backs to us just doesn't sit well with me. I wouldn't be friends with anyone like that, let alone sit in a restaurant and spend money on that kind of experience. I'm glad you enjoyed your experience at Forcella - indeed their food was delicious. But its disappointing to me that they would take their frustrations out on their customers. I hope this clarifies where I'm coming from.